Save today with our special offers! A pain in the drain means one call does it all when you have Faucetman Plumbing Co. to take care of all your plumbing problems. Our experienced plumbers can take care of all your plumbing and drain cleaning problems as well as handling maintenance and repair. With more than 30 years in the industry, our certifed plumbing company is fast, friendly, and courteous to all our customers. Our plumbers do the job right, and do it at a low cost. Small or large, our company has the know-how to handle any plumbing project in Southern California for all your plumbing and drain cleaning needs. Hidden water leak? 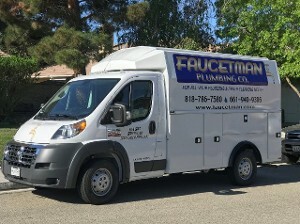 Find it fast with Faucetman Plumbing. No more leaks or high water bills! Call today to schedule a certified plumber! Once you recognize any of the above signs, it’s vital that you call in a Faucetman Plumbing professional as soon as possible. Leaks are very time sensitive issues, so you don’t want to let them linger for too long. We have plumbers in your area. Because many leaks are located underground, beneath foundations, or within walls, you don’t want to leave leak detection to just anyone. For some, it might be hard to detect the source without breaking through your property. But our plumbers know how much of a hassle that can be. We use top-of-the-line electronic leak detection methods to pinpoint the exact location and cause of the problem all while keeping your home intact. Sewer Video cameras have become one of the most valuable tools in the plumbing business. Specially made fiber optic cameras allow for a visual inspection of underground sewer lines and other piping to determine the condition of the inside of the pipe. A flexible rod with a high-resolution color video camera on its tip is inserted into the pipe for inspection. Video images are transmitted to the camera operator and can be saved onto a USB Flash Drive for a permanent record. Radio transmitters on the camera record the depth and physical location from the surface so that defects and obstructions can be corrected cost effectively. Call a Faucetman plumber today to schedule your inspection. After service, we will email you a private, personalized Youtube link with the footage for viewing at your convenience. A plumber will come in and detect your leaks or inspect your sewer and work alongside your maintenance crews or plumbers. There is no obligation to use any of our other services. We generally believe that Plumbing PEX Tubing is much better than Copper for most, if not all, plumbing systems. Why most People prefer PEX Tubing over Copper - there is a less risk of leaks with PEX Tubing. PEX doesn't degrade like copper, higher PSI rating freezing pipes will still burst, but PEX will be able to handle more freezing water than copper. PEX Tubing is much more resistant to freeze-breakage than copper or rigid plastic pipe. PEX Tubing is cheaper because it takes much less labor to install. PEX Tubing is quickly becoming the industry standard. PEX is cheaper/easier to install and you generally don't need as many fittings. Attaching PEX tube to fittings does not require soldering, and so eliminates the health hazards involved with lead-based solder and acid fluxes. PEX is also safer to install since a torch is not needed to make connections. Water flows more quietly through PEX tube, and the characteristic "water hammer" noise of copper pipe systems is virtually eliminated. Can PEX be buried in ground? Direct Burial of PEX Tubing. PEX tubing is approved for direct burial outdoors, a practice most often necessary when running a water supply line to a house. PEX, since it can expand, resists freezing more effectively than rigid pipe. What temperature can PEX withstand? Maximum Safe Temperature. The tube can withstand a maximum heat temperature of 200 degrees Fahrenheit for applications for heating. In a plumbing project, the PEX can withstand a maximum heat of up to 180 degrees Fahrenheit. Usually, the highest temperature limitation is listed on the PEX tubing in small prints. Thank you for visiting our website. Please fill out the form to request information about our products and services or to provide feedback about our site. We look forward to hearing from you.